Perfect! Made my badly put together, not fender, strat sound as close as I'm going to get to a real fender for under £200! Been put off doing it by so many people saying how hard it is and how it can kill your guitar, but if you follow word for word it's straight forward with amazing results. Cant thank you enough for taking the time to post this, cheers. I haven't tried this yet but after someone adjusted my guitar badly in a shop, I haven't ever been able to get it right. I hope this will help. You've gone to a lot of effort in your web site. Thank You! Fantastic..thanks so much. I enjoyed the whole set up process using your straightforward instructions.. Michael from Oz! Thanks for that. I've been tinkering for years, but have never got it right - I've just finished following your instructions in setting up mylatest project, a Jap Strat, and it now plays great. Thanks again. 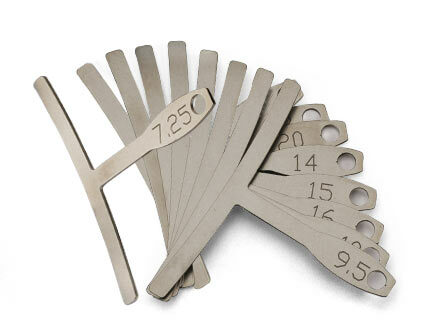 what can I use if i dont have a feeler gauge? You can use a B-string (or leftover bit you cut off the end) to check the height. It's just about the right thickness. Brilliant tutorial!! I can't thank you enough for this! Like someone posted before, someone did a mediocre job at the shop on mine and following your steps, I am excited with the results! Instructions here make it so much more attainable to do it yourself. It's like I have a whole new guitar. Cheers! Fantastic! Just got done with a Squier Strat. All set up and ready to jam. You, sir, are a life saver. As a Standard Strat owner, I couldn't manage to find out what was wrong it, as it was frequently dropping out of tune, it just dindn't sound right. First I thought it was a bend in the neck, but it turns out the intonation was the problem. Thanks for the quick tutorial. Thanks again for the comments. They are all very gratefully received and really make posting this stuff worthwhile. Thanks, a really useful article and easy to follow due to your writing style. A useful future addition would be how to do pickup height setup. Thanks, and great idea. I'll do a pickup height one in the near future. Thanks so much for this article. It's big help. I noticed that you don't talk too much about changing strings. This luthier suggests that you should change the strings before you do anything. Should we be worried out this? Hey Josh, I actually thought I HAD written something about using fresh strings, but looking back it seems I didn't. In reply to your question, yes, it's a good idea. Are you in trouble if you DON'T? I think you'll be OK, ha. Many thanks for this helpful info. I've just completed a setup on a strat copy, following your blog. It's really helped me to understand the balance of forces involved and the nuances of this type of guitar. Hey Ash, that's great. Thanks for taking the time to leave a comment. Thank you so much dear! Your article gives us a brilliant information regarding how to set up the guitar, which is the most essential point before going to use it. If want to know about some other Cheap Electric Guitar, then go through our website for the details. What you've got here is, "the ability to communicate", basically the opposite of the "Cool Hand Luke Mantra" being; "What we have got here is a failure to communicate". As Elton John sung in the song "Harmony", which we all need more of, you fit the bill excellently here. I have a cheap Asian Strat; but, I put a nice Warmoth neck on it and will be going through it Sunday using your tips here, my man Stu. Thank You and Kudos to all who believe like you as well. Harmony takes effort which you gave well here. Good Day to you sir! Believe in "Harmony", Harmony. We all make a yellow brick road when we care like you did here. Hey man, great article, and great site overall! I've found a ton of posts with useful and interesting info, so thanks for putting in the effort! Thanks for the compliments, folks. Much appreciated. Excellent job Stu. Thanks for posting it in such a clear way. It demystifies setting up the guitar. I have followed your suggestions and my Strat plays now much better. Great job! Hey, that's great. Thanks for the feedback. These are the most clear instructions that have ever been given by anyone on anything. Huge respect for your ability and generosity in sharing this! Thank you, now I'm going to go and read everything else you've written on you blog! Thank you. Enjoy the rest of the blog! so, my guitar is in need of setup, however, I don't have a tuner or any means of creating reliable reference pitch to be able to re-tune while adjusting things, the three low strings (E,A, and D) buzz pretty bad open and while playing up to about the 9th fret which leads me to believe I need to adjust the neck bow and saddle heights, any suggestions? Hi Jeremiah, you definitely need to correctly tune the strings before adjusting the neck, otherwise the neck tension will be wrong. You can either download a tuner app on your phone such as guitartuna, or even just find someone playing the notes on the Internet (very easy to find). many, many thanks for your setup guide. it's been a long time since I've fully setup a guitar, but your site motivated me to do it. Had an old plank of a guitar (Hamer super strat copy) which had a warped neck from new. I bought a cheap strat copy neck, (the guitar only cost me £60 new ! ), fitted it but it never really played right. I even fitted a set of Texas Specials to it ! Just spent an hour or so setting everything up (pickup height, neck relief, intonation, nut height, saddle height etc) and it plays 100% better ! Instead of sulking in a corner, it's now sat with it's other stable mates (8 more guitars ! - including an American Standard Tele with Duncan custom shop pickups, and an American Clapton signature deluxe) feeling rather happy with itself - and it's got good reason to be !!! David and Damon, that's great. Thanks for the feedback. Dad, great job getting the saddles where you needed them. Sorry about the unsubscribe thing. I've no idea how Blogger does that unfortunately. 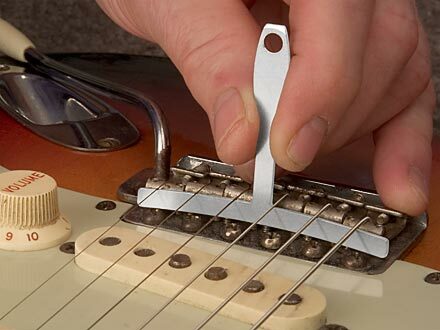 The set up is generally done with a capo on the first fret in order to circumvent any interference from the nut. If you find that everything is working great with the capo on the first fret and then once you remove that, things go wrong (e.g. strings are suddenly far too high, or there's suddenly tonnes of buzzing, etc. ), then that's the time to look into the nut. By the way, thank you for this excellent topic. I should have posted this all at once. Can the gap on the first fret be the same as the gap noticed on the second fret when holding down the string on the first fret. I am asking do you think it is safe to lower the nut slot with this in mind. It seams that if that gap is to high those lower notes if you finger to hard are sharp. I am working on a Les Paul Studio. Thank You. Hey EdFred, yes both strings (all six strings really, though of course it's trickier to measure the inner ones). Thanks Stu, that really makes sense. And thanks for sending the link for your 2012 post on making a new nut that is great. What is your opinion of Gibson's new nut (Tektoid) They say it is better then bone, as bone is not uniformly dense. I am so glad I ran into your Blog. Hey EdFred, thanks for your comments. It makes doing this worthwhile. Funnily enough I've tried quite a few materials for nuts, but haven't used Tektoid (yet). I'll let you know if that changes. Ive been building partscasters for years, been doing repairs even longer. Makes me wish I'd had the internet around when I was figuring all this stuff out for myself! Hahahaha great blogs, all of em, really spot on. It's really a hard task to tune an electric guitar. But this article is having the best tricks to tune the guitar. Thanks for sharing this helpful article. A very helpful and in-depth explanation of each step.